Yesterday night, at the unsociable hour of 11pm, I made the terrible mistake of asking my dad a question that I really shouldn't have. In between dicing up strawberries for my lunch box (yes, I own a lunchbox...), and wrestling with tinfoil (the tinfoil won), I for some reason thought it would be wise to ask my dad to explain the ins and outs of the dreaded 'm' word. Don't worry, it wasn't 'men'. I would never expect anyone to be able to explain that one. It was in fact, 'mortgage'. In hindsight, this really wasn't wise, as not only did the discussion prevent me from getting my 8 hours 40 minutes sleep before the trauma of getting up on a Monday morning (I really cannot function or speak properly after anything less), it also made me screw my face up so much that I'm surprised I haven't woken up with eye wrinkles. If you've haven't met my dad, you won't know that he explains things thoroughly. Well, he does. He's the kind of man that panics if a curtain is 1cm out of place, so as you can imagine, he considers every last minor detail in absolutely everything, and last night's discussion was certainly no exception. He is also brutally honest when it comes to filling me on the 'adult' world, leaving no room for my 'what if...' lightbulb moments, or the fact that 'I am absolutely, 100% definitely going to win Euromillions on Friday.' I am, I can feel it. Daddy B wrote me a list. The list explained the process that would take me from living at home in a room the size of a gerbil cage, with a hideously undomesticated brother who blocks the toilet up every 18 minutes, to living alone in my own gorgeous little chic-pad, and spending my evenings prancing round my own living room naked, just because I can. It also showed me everything I'm going to need to pay for, in between hosting terrible dinner parties and buying wonky clown ornaments. I knew the list was going to be a hefty one, and I knew there would be a lot of high figures along the way. However, nothing could prepare me for the piece of paper that was handed to me before bed last night. It was a list the size of Russia, which made me realise that a) us human folk should have refused to complicate the evolutionary process and stayed put with our caves and fig-leaves, and b) that I have a scary amount of saving to do. Goodbye nice clothes, weekends away, and social life. It's been nice knowing you. I couldn't help but wonder why the devil no-one has ever told me this before. Fair enough, I spend 19 hours out of every day wrapped up in my own, naive, dreamy little bubble, and had I wanted to do the research, I could have taken the responsibility upon myself to do so. However, I really do think that some of this 'adult world' stuff needs to find its way into the school curriculum. I'm not saying that 16 year olds deserve the full brutality of knowing exactly how much it costs to be a human being these days, but a little advice and guidance, sandwiched between double Maths and Media definitely wouldn't have gone a miss. At least that way I wouldn't have almost hyperventilated when I saw the damage. As far as I'm concerned, I now have three options; pretend the list is a mountain, and do everything in my power to get to the top (no crime allowed), scrap the whole idea, get some of my friends drunk, and convince them that lazing around in the forest eating chicken, climbing trees, and looking for hunky cavemen is the way to a happy life, or put my new slippers on and cry. At the moment I'm heading towards the latter, without the crying part. Yes, that's right, I have realised how much everything I want to achieve is going to cost, and all I have done about it so far is put my new slippers on. Don't worry though, I'm sure you've all realised that I'm probably a bit too optimistic, and I've no doubt that tomorrow I'll wake up full of confidence that I will, one day, own a dinky, little flat, and a sofa with patchwork cushions to put in it. After all, if my friends refuse to come to the forest with me, my next step will be to convince them to build a human bookshelf out of themselves so I can save myself a few pennies. Either way, I'm going to win. The fear of the future absolutely excites me at the same time, and I've already ticked one thing off of my 'must buy for non-existant flat' list. On Saturday, Innocent gave me a tea towel. My life is well and truly sorted. Tomorrow I'll write a blog post about something a little more cheerful, you can count on it. Maybe we'll talk about something festive (come on, it's practically Christmas), or maybe I'll take you all on a wild holiday with my mortgage savings. Love, hugs, and kisses! 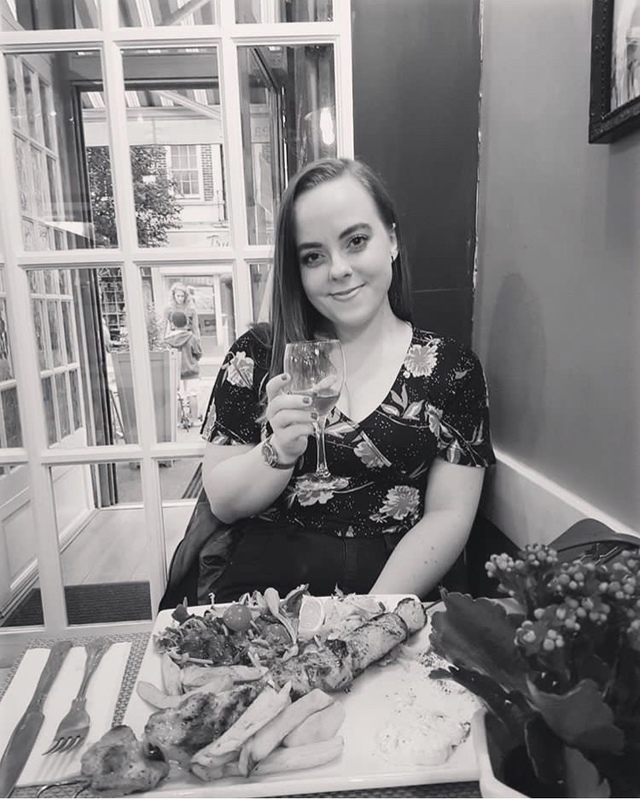 Hello to my gorgeous new followers, and thank you ever so much to Rachel at 'Life of a Sweetaholic' for interviewing me and putting it up on her blog today. That girl is a babe and a half! Great post over at Life of A Sweetaholic, hun! & I hate the dreaded mortgage word too...boo! I feel your pain! I've been trying to save for a mortgage and it's scary stuff and the amount you need is ridiculous. i'm terrible at saving though :( Wish i had been warned in my teenage years what exactly goes on! I cannot tell you how much I loved reading this post (like all of your others but shhh)! All I am going to say is.. don't worry about the future. I am in the process of buying my first house with Liam and the money side scares the sweeties out of me. But once you have meetings and work things out it will all be more clear and not a huge list like your dad has given you. I am still scared of the money side and couldn't believe people hadn't warned me about it all before! !